With the launch of its single-chip reconfigurable receiver achieving industry state-of-the-art performance, IMEC matures its flexible radios in deep sub-micron digital CMOS to ease the implementation of both the analog and the digital functionality into the same system-on-chip (SoC). The architecture optimally benefits from the speed advantages of chip technology scaling resulting in low cost, low power radios. In parallel, IMEC is working on digitally inspired flexible radios ultimately targeting a true software radio. At today’s International Solid State Circuit Conference, IMEC presents its 45nm single-chip reconfigurable receiver with power, performance and area competitive to state-of-the-art single mode radios. The receiver is fully software configurable across all channels in the frequency bands between 100MHz and 5GHz. The IC uses only 1.1V supply voltage and has an active area of 2mm2. Depending on its configuration it consumes from 54 to 105mA. The radio can be configured for multiple state-of-the-art and future wireless protocols such as GSM, GPS, EDGE, WCDMA, HSDPA, CDMA2K, EVDO, LTE, 802.11ab/gn, DVB-H and 802.16d/e. Its high level of integration and ultra-low power consumption make it suitable for use in a wide range of both single and multi-mode mobile devices – handsets, smart phones, PDAs, PC cards, USB dongles, etc. The complete transceiver will be taped out in April 2009. Industry can get a head start for their mobile devices of 2011, by joining IMEC’s reconfigurable radio research program in which they get access to the technology and build up early knowhow on the transceiver. 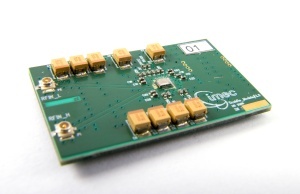 Going one step further IMEC also reports a prototype RF band-pass sigma-delta ADC with a bandwidth of 60MHZ at 2.4GHz. With this architecture, ultimately, the analog to digital conversion would be placed at the antenna shifting all signal conditioning to the digital domain. “Currently the performance is not yet sufficient but we have a clear roadmap towards the dream of digital software radios,” said Rudy Lauwereins.